A: RESET is a 501 (c)(3) nonprofit education organization composed of volunteer science, technology, engineering, and math (STEM) professionals. Its mission is to motivate children to discover and explore the worlds of science and math, and to encourage them to consider educational and career choices in related fields. Q: How long has RESET existed? A: RESET was founded by Dr. Harold Sharlin in 1988. It was incorporated in 1995. Q: How old are RESET volunteers? Q; What credentials do I need to become a volunteer? A: RESET volunteers have pursued a STEM career or are studying to do so. There are no educational requirements and volunteers are not expected to have teaching experience. Some volunteers have advanced degrees or have worked for many years in a STEM profession, while others have just started their careers or education in a STEM field. All of our volunteers are passionate about STEM learning and careers. Q: I don’t have experience in teaching children. Is that okay? Q: How will I be prepared? A: Volunteers are given plenty of support and training before they walk into a classroom. In addition to an initial briefing by RESET staff and a consultation with your assigned teacher, you will be given the opportunity to participate in volunteer orientation and training sessions and to observe veteran volunteers in the classroom. RESET also provides volunteers with a Volunteer Handbook. Additional support is provided through a regular Blog, quarterly newsletters, YouTube videos, and the learning resource area on this web site. And finally, RESET has a teacher consultant on staff who is available to observe you in the classroom and provide feedback on how to improve your RESET sessions. Q: What grade levels and schools does RESET serve? A: RESET currently offers programs for PreKindergarten, elementary, and middle school students. Most of our programs are offered to public elementary schools. 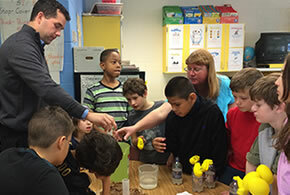 We serve schools primarily in the Washington, DC metro area, including Maryland and Northern Virginia. In 2017, RESET began its first pilot programs in Burlington, Vermont and Wilmington, Delaware. Q: Will I be assigned a school or can I choose where I want to volunteer? A: The choice of a school is up to you. Several factors may impact that choice. For example, you may be interested in a school that is close to where you live or you may prefer to work with a specific type of student, such as those with special needs, those from under-resourced communities, or those who are more advanced learners. Some volunteers prefer working with a specific age group, which can determine what school they partner with. Other volunteers have built strong relationships with particular teachers over the years, and they prefer to continue those relationships. RESET’s Executive Director and Volunteer Coordinator will discuss this with you and match you with a school that best meets your preferences. Q: How long are RESET programs? A: RESET programs are typically six-session classroom programs that run in the fall and spring and include a field trip to a STEM-related site. However, volunteers also have the option of participating in after-school, weekend or summer programs. Learn more about your options». Q: How long is each RESET session? A: Each session lasts between 45 and 60 minutes, which is usually determined by the time scheduled for science in your teacher’s classroom. You will need to also factor in preparation and travel time. Q: How much of a time commitment will I need to make to RESET each term? A: New volunteers typically invest more time, as they must prepare and train for the program. A first-year volunteer typically spends 4 hours in training, 12 hours in preparation, and 6 hours in classroom sessions. Travel is additional. Q: Do I have to come up with the experiments myself? A: Volunteers develop their own experiments or are trained in experiments already in use. In addition, you’ll find ideas for experiments through recommendations from other volunteers, online and library resources, and RESET’s YouTube videos. Web and YouTube searches for elementary science experiments yield many results; you can narrow your search by using a specific science or math field in the search terms (e.g., “geology”). In addition, you will often receive guidance and direction from the teachers themselves. Q: Do I have to provide my own supplies and equipment? A: No. RESET will reimburse for all reasonable expenses. Guidance is provided on the maximum amount that can be spent. Q: What if I have a busy fixed schedule? A: We understand that some volunteers have more available time than others. In addition to after-school and summer programs, RESET also offers opportunities to work as part of a team. We have partnered with a number of professional societies, corporations, and agencies, which allow volunteers to join an employee team of volunteers, in which volunteer work is shared. Q: Do I have to do a field trip? A: The field trip is a nice capstone to what the children learn during their RESET sessions, and most students find it an exciting part of their STEM program. RESET hopes that every program will include a field trip, but in some cases school policies and schedules do not allow for field trips. Unless your school has a budget for field trips, RESET covers transportation and admission fees. Q: Will I ever be left alone with the children? A: No. Teachers or other school officials are required to stay in the classroom during the entire RESET session. The best way to avoid a problem is to make sure the teacher is aware of this requirement from the start. If this becomes an issue, please report it to RESET’s Volunteer Coordinator so that it can be addressed with the teacher. Q: What should I do if the teacher doesn’t participate? A: Teachers are strongly encouraged, but not required, to participate in your sessions with the students. RESET sessions tend to be more successful with teacher participation, and most teachers are eager to join in. Q: Why does RESET emphasize hands-on learning? A: Hands-on learning is an educational method that directly involves students by actively encouraging them to do something in order to learn about it. Students find it more fun and engaging than lectures, so it advances RESET’s goal to spark enthusiasm and motivation in STEM learning and careers. A: It’s easy. Simply contact reset@resetonline.org or 703-250-0236, or fill out our Volunteer Signup Form. We’ll contact you as soon as we receive your expression of interest.